I wrote this story four years ago for my son Matthew, when he was three years old. This text was supposed to support a video story featuring my son Matthew, his toys and our cat Bundi. The video was never finished but the text remained. If it were not for the watchful eyes of his mom, Mathew would – with a generous help of his dad – like to turn the entire house into his big Kingdom of Sodor. But with sweet persuasions the boys have agreed to limit their kingdom to a table, with the occasional expansions to the floor around the table, and with imagination that is reaching to the most distant corners of world – across many mountains, forests and seas. 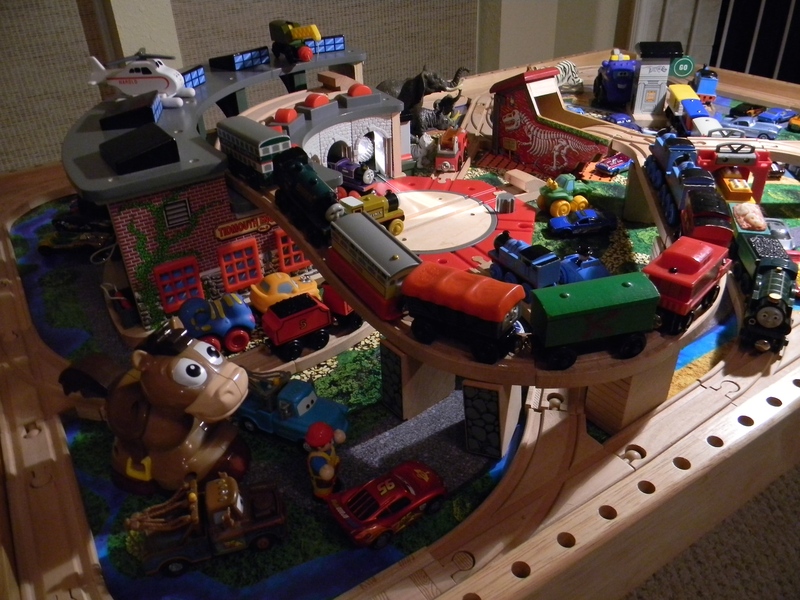 For many days and hours the Kingdom of Sodor is an orderly place where peace and tranquility reign. But above all Sodor is a place known for a strong bond of friendship that embraces all its inhabitants. Not only that the train engines Thomas, James, Emily and Toby are good friends among themselves, but they all share their friendship with the famous cars – Lightning McQueen, Finn, Doc Hudson, and Mater, and with many others of course. If you wouldn’t know them well enough they would all at first appear to be shy creatures. But the moment your eyes go elsewhere, the Kingdom of Sodor becomes a very much alive place; with Thomas leading in mischief and trying to be an useful engine. Often it seems that they could easily take care of themselves without the supervision of the conductor Matthew. One day, or more precisely one night something happen to the Kingdom of Sodor. 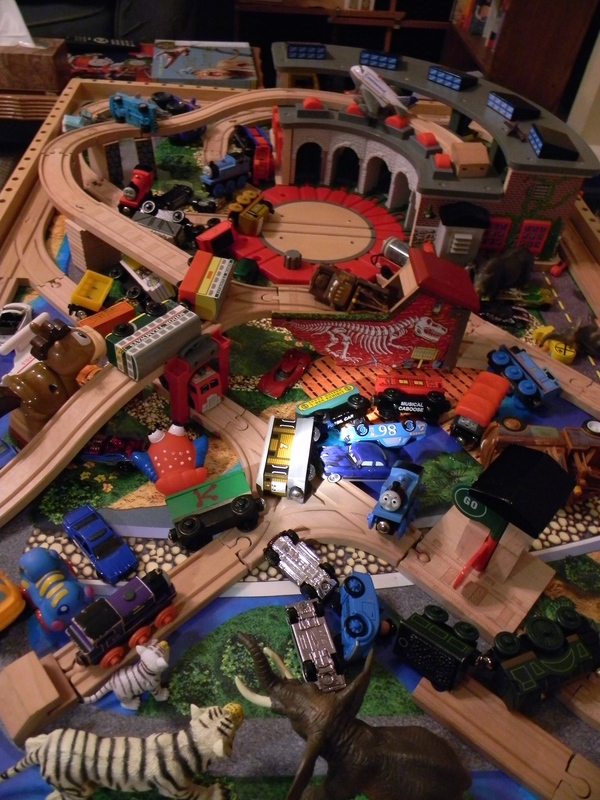 As if a powerful wind or destructive earthquake swept across the famous Sodor Central Train Station. Nothing and no one was left untouched. All engines, fright cars, vehicles, animals, even people were overturned and scattered across the station’s platforms, tracks and bridges. Conductor Matthew was immediately summoned to come to the station in distress. “Who or what could have done this?” This was the question that worried the conductor Matthew, whom Sir Topham Hatt had appointed to be the supervisor over all the engines and vehicles in the Kingdom of Sodor. But there was no time to loose. Questions will have to wait since there was so much to be done to bring the Sodor station and its trains in the working order again. Immediately the conductor began to pick up gently one engine after another, placing them on the tracks again. There was so much clearing work to be don that Matthew called even his dad to help. Some of the engines, including Thomas, needed to visit the repair workshop. After a full day of hard work the Sodor Central Train Station was restored to its old glory. But, then, just as the conductor Matthew was saying to his dad what a full day this was, they both noticed a giant shadow moving ever closer to the Sodor Station. “What’s that?” – wondered Matthew, asking the question that he asks many times nowadays. “What’s that?” – they both wondered and waited. And then they say it. Their cat Bundi jumped into the station and was now moving graciously among the trains and cars, looking for a place where he would rest comfortably. “Bundi, gooo away!” – Matthew the conductor was pleading with the giant cat, who seemed to be determined not to pay any attention to Matthew’s pleas. Instead, he slowly moved to a location that would provide him with even more comfort. And there he rested for a while without paying any attention to anyone or anything around him. There and then Matthew and his dad decided that they needed to do something urgently. As Matthew was whispering to the Bundi’s ear “Bundi, you can’t sleep here”, they both gently carried the unwilling cat across the station and back to the floor. “ Bundi gave them a look as if saying “I will be back when no one is watching”, and moved lazily to his favorite spot in the house in which he knew no one would bother him. By now everyone was tired and ready to go to bed except Thomas, who still wanted to push several train carriages to their platforms before going to bed himself. “I want to be a useful engine and I haven’t had much chance for it today” – he said. But soon he was tired too and, having pushed a couple of carriages to their places, Thomas joined his friends for the nights rest. This entry was posted in Children Story and tagged Cat, Children Story, Conductor, Doc Hudson, Emily, James, Mater, Sodor, Thomas, Thomas and Friends, Toby. Bookmark the permalink.